Scroll down for our collection of free printable Valentine's Day Cards - perfect to give to the kids (from an admirer, of course) or for the children to distribute at school. This lovely Valentine's Day card is very easy on printer ink. It is designed to print out onto A4 paper and be folded twice. Two little Valentine angels adorn this pretty printable card, and the wording says "I Love You." This pretty valentine card looks lovely printed onto either glossy or matt card, or good quality matt paper. You will need to use your printer's borderless settings for the best result. We also have a colouring version. A cute pink teddy bear says "You're Grrreat" on the front of this lovely printable card. It's perfect for Valentine's Day - or any time, really! 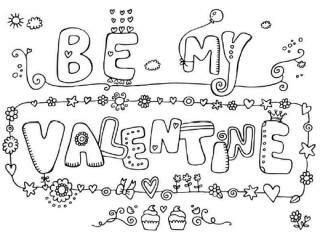 There's a cute cherub asking "Be My Valentine" on this fun printable card! Here's another of our bright and cheerful Happy Valentine's Day cards, ready to print, fold and give to someone special! Here's a very pretty Valentine's Day card, and it's simple and easy to print out - just fold in half and give to someone you love! Hoppy Valentine's Day! Celebrate by printing out this card and simply folding in half, writing inside and giving it to someone special. This printable card features a lovely hand-drawn "I Love You" design. Perfect for Valentine's Day but useful for any time you want to express the same sentiments! Our 'Kiss' doodle card is cute and colourful - perfect for Valentine's Day! Simply print onto some card, then fold in half. Sometimes you just need a quick card to print, fold, write and give. This one is perfect for all sorts of occasions, including Valentine's Day, of course! Here's a pretty card to send to someone you love - perfect for Valentine's Day, but just as lovely to send and receive any other time of year! Send this pretty card for Valentine's Day, or anytime you want to show someone that you love them! Simple cards are often the best, and this one simply says the word "Love". It won't use up too much ink and it's perfect when you need a last minute greetings card. Here's a lovely, simple Valentine's Day card to print, fold and give, with a worded heart design in valentine pink! Do you know a loveable monster? Or perhaps you are one?! If so, this is the printable Valentine card for you! Here's our second set of small Valentine cards, printing four to one piece of A4 printer card. Simply cut out and fold once. Perfect for children to hand out in the classroom. One piece of printer card, four miniature Valentine cards! Kids will love cutting and folding these little cards and they are perfect for them to give out in the classroom.